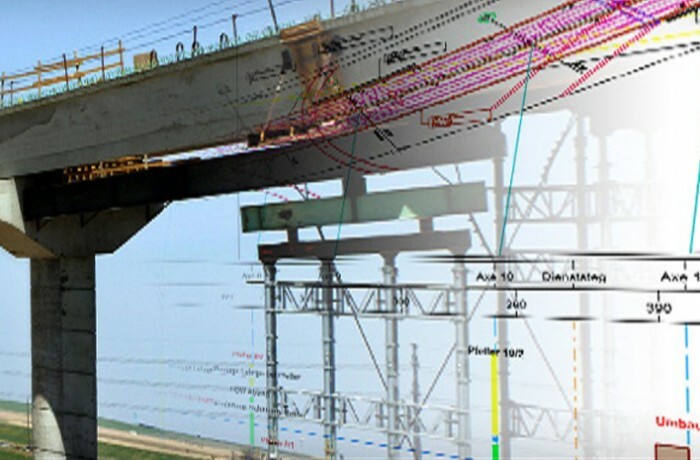 Special functions of this infrastructure project management software: bulk creation of tasks In bridge projects the pile and foundation works are normally created as rectangles showing at which pile the work gets executed. This work is repeated n time for each pile. TILOS supports bulk creation of tasks - each on the defined position. 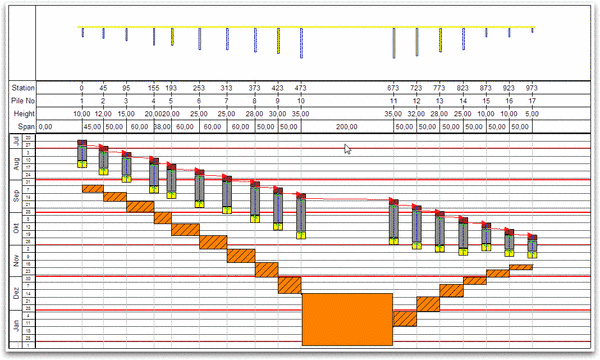 The deck work can be shown as single rectangle between 2 piles or line task across many piles. There is a special display mode that allows to segment the rectangle between 2 piles. The duration can be set up on behalf of a distance dependent profile. The scales show the position of the pile, their numbers the height and also the span between the piles. These data were imported from an Excel tables into a TILOS profile. Further imported values are the execution time for each pile and also for the deck work. With this information, the piles works can be just generated at the their position based on the work pattern for each pile: Foundation / Pile work and Girder.